This is the Service Agreement for the RecruitmentForce Online Software Service (“RecruitmentForce”). In this Agreement “we” and “us” means RecruitmentForce Limited of Suite 2, 2b Collingwood Street, Newcastle-Upon-Tyne, NE1 1JF. (2) (if you are registering your company to use the service) that you have authority to enter into this Agreement on behalf of your company. If you are entering into this Agreement on behalf of your company, the Term “you” in this Agreement means your company and all of its employees. If you do not agree to the terms of this Agreement, please do not submit the form or request a subscription to RecruitmentForce. 1.1 RecruitmentForce consists of a service which involves the provision of a browser interface (where appropriate), data encryption, data transmission, data access, contact management software and data storage. 1.2 We will provide RecruitmentForce on and subject to the terms of this Agreement. ii. unscheduled maintenance performed outside Normal Business Hours, provided that we have used reasonable endeavours to give you at least 6Normal Business Hours’ notice in advance. 1.4 For the purpose of this Agreement Normal Business Hours means the hours of 9am to 5pm Monday to Friday except for public holidays. 1.5 We will, as part of RecruitmentForce and at no additional cost, provide you with our standard customer support services during Normal Business Hours in accordance with our Support Services Policy in effect at the time that the RecruitmentForce is provided, as well as free initial on-line training. We may amend the Support Services Policy in our absolute discretion from time to time. You may purchase enhanced support services or additional training separately at our then current rates. 1.6 We will provide RecruitmentForce with reasonable skill and care, but we do not warrant that your use of RecruitmentForce will be uninterrupted or error-free; nor that RecruitmentForce and/or the information obtained by you through RecruitmentForce will meet your requirements; and we are not responsible for any delays, delivery failures, or any other loss or damage resulting from the transfer of data over communications networks and facilities, including the internet, and you acknowledge that RecruitmentForce may be subject to limitations, delays and other problems inherent in the use of such communications facilities. 1.7 We will inform you of any significant changes to RecruitmentForce or to the terms and conditions of this Agreement that we may make from time to time. 2.1 RecruitmentForce grants to you subject to the terms and conditions of this Agreement, a non- sub licensable, non-exclusive and non-transferable licence to permit the authorised number of users to use RecruitmentForce, in object code form only, and only in accordance with the applicable end user documentation, if any, and solely in conjunction with this Agreement. 2.2 The number of authorised users shall be determined by the purchase by you of individual subscriptions. You agree that the maximum number of users permitted to use RecruitmentForce shall not exceed the number of user subscriptions you have purchased from time to time. You further agree that you will not allow any user subscription to be used by more than one individual authorised user. Each authorised user shall keep a secure password for his use of RecruitmentForce, and we recommend such password should be changed no less frequently than monthly. Each authorised user shall keep his password confidential. You will maintain a written, up to date list of current authorised users and provide such list to us within 5 business days of our written request at any time or times, and permit us to audit the details supplied, at our cost in such a manner as shall not substantially interfere with you normal business. (f) attempt to obtain, or assist third parties in obtaining, access to RecruitmentForce. 2.4 You must use all reasonable endeavours to prevent any unauthorised access to, or use of, RecruitmentForce, and in the event of any such unauthorised access or use, promptly notify us. 2.5 You acknowledge that we retain exclusive ownership throughout the world of RecruitmentForce, any portions or copies thereof, and all rights therein. Upon termination of this Agreement for any reason, this Licence will terminate, and you, and any user accessing RecruitmentForce by means of a company account, if applicable, will cease to use or have access to RecruitmentForce. vii. and we reserve the right, without liability to you, to disable your access to any material that breaches the provisions of this clause. 3.2 You hereby agree to defend, indemnify and hold us blameless against any claim or action that arises from your use of RecruitmentForce in an unlawful manner or in any manner inconsistent with the restrictions and policies stated herein. 4.1 Our policy is to respect the privacy of our users. We may provide information such as your name, address, and credit card number to organizations (such as credit verification and billing services) to ensure that we receive proper payment for our services. We will not share, rent, sell, or trade personal information (including e-mail addresses) that identifies our customers or users to third parties. We will not share, rent, sell, or trade data contained in your account. 4.2 However, we may use this information to contact you to ensure that you are satisfied with RecruitmentForce and our performance, learn about any ideas you may have to improve our offerings, call your attention to additional offerings or services we provide, and communicate other information that we believe will be useful. In addition, we may share e-mail address and other information required to ensure that our channel partners and contractors can provide services and support subscribed to by you. 4.3 We may occasionally ask you to provide demographic or personal preference data. If you elect to provide such data, we may use them to analyse the characteristics of our customers and visitors to the RecruitmentForce Web site. We may also use such data to customize the specific information provided to you, or tailor it to better meet your needs. We may share information aggregated from such data with third parties without notifying you. 5.1 You own all rights, title and interest in and to all of the data which you upload and store within RecruitmentForce and have sole responsibility for the legality, reliability, integrity, accuracy and quality of that data. 5.2 We will follow our archiving procedures for your data as set out in its Back-Up Policy available at such website address as may be notified to you from time to time, as such document may be amended by us in our sole discretion from time to time. In the event of any loss or damage to that data, your sole and exclusive remedy shall be for us to use reasonable commercial endeavours to restore the lost or damaged data from the latest back- up of such data maintained by us in accordance with the archiving procedure described in its Back-Up Policy. We will not be responsible for any loss, destruction, alteration or disclosure of data caused by any third party (except those third parties sub-contracted by us to perform services related to data maintenance and back-up). v. both of us shall take appropriate technical and organisational measures against unauthorised or unlawful processing of the personal data or its accidental loss, destruction or damage. 5.4 We will use all reasonable efforts to protect your data behind secure firewall systems. 5.5 We operate a Fair Use Policy in connection with data storage enabling reasonable storage in relation to the business practices of any individual client and revenue we receive for the service. We do not impose any set storage limits and ask that you do not abuse this policy. RecruitmentForce is not to be used as a repository for bulk storage from other internet sources such as Job boards or CV databases. We reserve the right to charge additional storage fees or suspend accounts if this policy is abused. 5.7 We provide a bulk import interface enabling a swift free self-service import facility for your data. You are responsible for the loading of your data, its quality and integrity. Any expertise required to correct errors in data entry will attract charges to correct these at our standard rates. We do not as part of this Agreement provide a managed data import or data migration service as part of RecruitmentForce. 6.1 We provide a bulk e-mail service. You are responsible for all content sent via email. We cannot and will not be held responsible for any issues, complaints or blacklisting that arise from using this functionality or any abuse of the system. 7.1 You will pay the Subscription Fees to us for the User Subscriptions in respect of the number of authorised users, in accordance with this clause. .2 You will on registering to use RecruitmentForce provide to us valid, up-to-date and complete credit or debit card details or approved purchase order information acceptable to us and any other relevant valid, up-to-date and complete contact and billing details and, if you provide your credit or debit card details to us, you hereby authorise us to bill such credit or debit card for the amounts set out in 7.3 below. 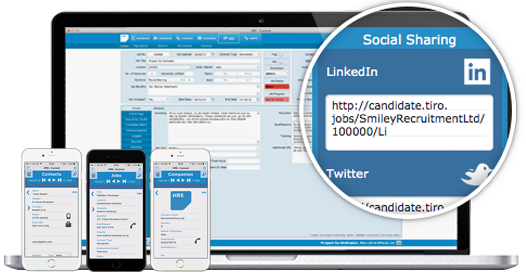 .3 On the date of registering to use RecruitmentForce you will pay to us the Subscription Fees payable in respect of the initial 1 month from that date, and on the same date of subscription on each following month and we will provide you with an invoice in respect of each such payment. ii. interest shall accrue on such due amounts at an annual rate equal to 3% over the then current base lending rate of The Yorkshire Bank at the date the relevant invoice was issued, commencing on the due date and continuing until fully paid, whether before or after judgment. iii. are exclusive of value added tax, which shall be added to our invoice(s) at the appropriate rate. 8.2 If RecruitmentForce is not used within the period of time for which payment has been made, that time may not be carried over into any subsequent period. You remain responsible for payments for any unused period. 8.3 All prices are subject to VAT at the applicable rate. 9.1 By becoming a user of RecruitmentForce, we may, at our discretion, issue a press release announcing the use of RecruitmentForce by you. As of the date of registration to use RecruitmentForce, you hereby grant us the right to refer to your use of RecruitmentForce, along with your logo, on the customers section of our web site until such time as: (a) this agreement is terminated or (b) you discontinue use of RecruitmentForce. 10.1 If you are operating as a employment agency or an employment business (as defined by the Employment Agencies Act 1973 (‘the Act’) it is your responsibility to ensure that advertisements you place via RecruitmentForce to your website or any third party job boards comply with your obligations under the Act and Conduct of Employment Agencies and Employment Businesses Regulations 2004 and or any local Acts that apply. You agree to comply with the Act(s) and these regulations as they affect the conduct of your business and the advertisements you place on your website and these job boards. 11.1 It is your responsibility to apply and hold a valid Data Protection number in line with your responsibilities as an employment agency and employment business in-line with the Data Protection Act 1998 or any local Acts. We are not responsible and cannot be held responsible for your failing to comply with said Act(s). 12.1 This Agreement is a monthly agreement, renewable unless either party requests termination of the agreement by giving thirty (30) days notice. If you have agreed to subscribe to RecruitmentForce, you will pay in full for RecruitmentForce up to and including the last day of the contract term. To cancel RecruitmentForce or reduce/remove modules/services provided by us, you must update your user account. We will email you detailing the contract details and fees due on the anniversary of your subscription date. 12.2 We will delete archived data, but will not do so until ninety (90) days after the termination of this Agreement. 12.3 Upon expiration or termination, you will immediately cease all use of the RecruitmentForce and any applicable end user documentation. You are entitled to retrieve a back-up of your data, subject to your then current fees being paid. 12.4 The following provisions of this Agreement shall survive termination or expiration of this Agreement: Section 2.5 (regarding our ownership of RecruitmentForce), 3, 7 (regarding payment obligations), 10, 11 and 12. Termination is not an exclusive remedy and all other remedies will be available whether or not the licence granted herein is terminated. Notwithstanding the foregoing, if you are dissatisfied with RecruitmentForce, the materials available on or through RecruitmentForce, or with any of our terms and conditions, your sole and exclusive remedy is to discontinue using RecruitmentForce. not represent or warrant that RecruitmentForce will be uninterrupted or error-free, that defects will be corrected, or that this site or the server that makes it available, are free of viruses or other harmful components. Any material downloaded or otherwise obtained through the use of RecruitmentForce is done at your risk and you will be solely responsible for any damage to your computer system or network, or loss of data that results from use of RecruitmentForce. 14.1 Our total liability with respect for the subject matter of this Agreement (including, but not limited to, liability arising out of contract, tort, strict liability, breach of warranty or otherwise), will be limited to the fees paid by you to us for RecruitmentForce under this Agreement in the 12 months prior to the act of injury that gave rise to the liability. Neither we nor our licensors shall be liable in any event for loss or inaccuracy of data, loss of profits or revenue, or indirect, special, incidental or consequential damages (including, without limitation, the cost of any substitute procurement), whether or not foreseeable and even if we have been advised of the possibility of such damages. 15.1 This Agreement is between us and you, and is not for the benefit of any third party, whether directly or indirectly (including, if applicable, any user accessing RecruitmentForce by means of an account established by you). The failure of either party to exercise in any respect any right provided for herein will not be deemed a waiver of any further rights hereunder. If any provision of this Agreement is found to be unenforceable or invalid, that provision will be limited or eliminated to the minimum extent necessary so that this Agreement will otherwise remain in full force and effect and enforceable. This Agreement is not assignable, transferable or sub licensable by you except with our prior written consent. 15.2 This Agreement will be governed by and construed in accordance with English law. You and we agree to submit to the exclusive jurisdiction of the courts located in England. 15.3 Both parties agree that any cause of action arising out of or related to RecruitmentForce must commence within one (1) year after the cause of action arose otherwise, such cause of action is permanently barred. 15.4 Both parties agree that this Agreement is the complete and exclusive statement of the mutual understanding of the parties and supersedes and cancels all previous or contemporaneous written and oral agreements, communications and other understandings relating to the subject matter of this Agreement, and that all modifications must be in writing signed by both parties, except as otherwise provided herein. 15.5 No agency, partnership, joint venture, or employment is created as a result of this Agreement and you do not have any authority of any kind to bind us in any respect whatsoever. 15.6 All notices under this Agreement will be in writing and will be deemed to have been duly served, if personally delivered; when receipt is electronically confirmed, if transmitted by facsimile or e-mail; the day after it is sent, if sent for next day delivery by recognized overnight delivery service; and upon receipt, if sent by certified or registered mail, return receipt requested. 15.7 It is the express will of the parties that this Agreement and all related documents have been drawn up in English. RecruitmentForce Ltd. Recruitment technology experts. you source, connect and engage more candidates.